MLA : Blogs : Chapter News: Join the Midwest Chapter for the Jeans and Khakis Conference! 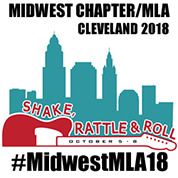 In the spirit of rock ’n’ roll and the “Shake, Rattle, and Roll” theme, the Midwest Chapter invites you to attend the “jeans” conference. That’s right, it’s not a typo! We are wearing jeans and our favorite band t-shirts during the 2018 Midwest Chapter of MLA Annual Conference, but you are welcome to wear khakis, if that is how you rock your style. Early bird registration is available for the 2018 Midwest Chapter Annual Conference, October 5–8, 2018, in Cleveland, OH, and you can register today. Learn about Cleveland and all the places to explore before the conference, during the breaks, and after the conference. Last but not least, reserve your hotel room at the Westin Cleveland Downtown, which is the conference venue. We are excited to welcome you to Cleveland and the “Shake, Rattle, and Roll” conference this October!